Based in the North West province of South Africa, Sun City Resort is set between the Elands River and the Pilanesberg, just two hours drive from Johannesberg. The resort also borders the Pilanesberg Game Reserve, where South Africa’s Big 5 – Elephant, Rhino, Lion, Leopard and Buffalo roam free. Back in 1979, Sun City was developed by the hotel magnate Sol Kerzner as part of his Sun International group of properties. To this day Sun City remains one of the most luxurious holiday destinations in South Africa. There are numerous Sun City attractions to keep you entertained, whatever your taste, to make your holiday memorable. 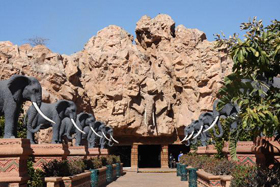 Couples, families and even the elderly will find Sun City amazing and entertaining. 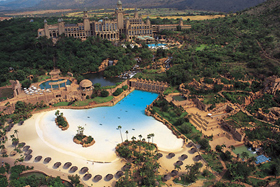 There are 4 luxurious hotels at the Sun City resort, The Palace of the Lost City, Cascades, Sun City Hotel and Cabanas. In addition to the four hotels, the complex includes time-share facilities called "The Sun City Vacation Club". Situated in the Sun City Hotel, the casino is open 365 days a year, from 13h00 in the week and 11h00 on the weekends. Games go on till the early hours, so why not try your hand at American Roulette, Blackjack, Stud Poker or Punto Banco. Overnight visitors to any of the hotels or the vacation club have free access to the Valley of the Waves. This is the most advanced water park in South Africa, boasting five exhilarating flume rides. Less adventurous visitors to the Sun City Resort can take a ride on the 'Lazy River', to float around at a calmer pace. The Superbowl within Sun City is a superb 6,000 seater stadium. Musicians such as Liza Minelli, Shirley Bassey, Frank Sinatra, Bryan Adams, Queen and Rod Stewart to name a few have all performed at the arena. The Superbowl is also a favourite venue for Miss South Africa and even Miss World beauty pageants and star studed spectaculars. Within the Sun City resort there are two high quality 18 hole golf courses, the difficult and demanding Gary Player Golf Course and the Lost City Golf Course which is aimed more at golfers of various levels. Since 1981, the Gary Player Golf Course has been home to the Nedbank Golf Challenge, where the worlds leading players battle it out for the top prize of $2 million. Pilanesberg is named after a Tswana chief, Pilane. 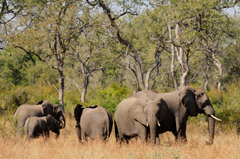 It is a malaria free game reserve where South Africa’s Big 5 – Elephant, Rhino, Lion, Leopard and Buffalo can all be found roaming free. 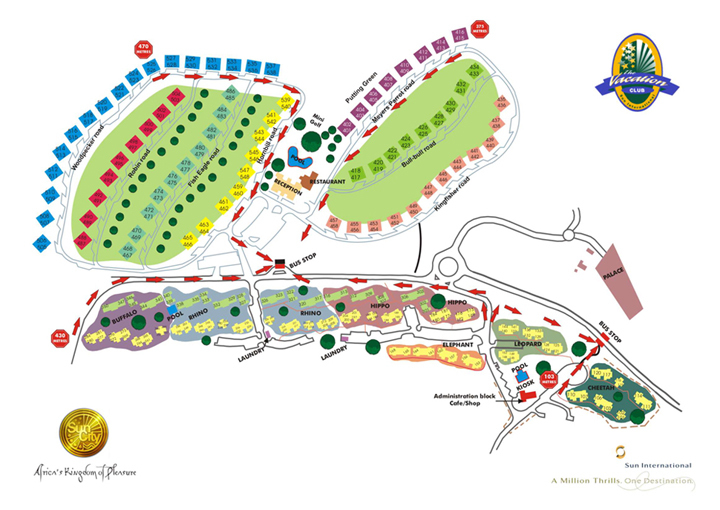 In order to find your way to Sun City , we have created a Sun City directions map. Please feel free to download, print or share the map from the following link : Sun City Directions Map .